This year, join us March 13th and 14th in Raleigh as we host our annual Advocacy Days which we promise to be packed full of information you cannot afford to miss! There is no shortage of issues at hand in North Carolina and NOW is the time to make our voices heard! Register today! Join us for a candid discussion as the NC Attorney General, Josh Stein, updates NCMGMA membership on how the Department of Justice is working to protect the business of North Carolina’s healthcare industry including updates on medical marijuana and the current opioid crisis. Always a fan favorite, hear about the many hot topics affecting medical practices in North Carolina. Chip Baggett will provide the group with insight into all that is happening in downtown Raleigh during the current session. Mr. Folwell will present on high-priority items including reimbursement changes for State Health Plan patients, the state’s relationship with Blue Cross, and the cost-saving measures the treasury department has demanded. Don’t miss this opportunity to talk to the Treasurer face-to-face about how the proposed fee schedule will impact your practice! Hear the latest updates on Medicaid transformation and the critical timelines you need to know as the program moves forward. As DHHS plans to announce their selections for PHP insurers in February, we will be prepared to ask questions onsite about the carriers that will administer Medicaid benefits and claims adjudication, as well as the state’s role in overseeing the contracting and credentialing process and ensuring carrier compliance. gear up for Thursday’s assembly meetings and legislative visits. Josh Stein was sworn in as North Carolina’s 50th Attorney General on January 1, 2017. Stein is focused on protecting North Carolina families from crime and consumer fraud. Stein has made combating the opioid crisis a top priority. His office drafted the STOP Act to reduce the number of people who become addicted to opioids through smarter prescribing practices and the Synthetic Opioid Control Act, closing loopholes in state criminal law concerning fentanyl. Both laws passed the General Assembly unanimously and were signed into law by the Governor. Prior to being elected Attorney General, Stein served as a state Senator and as a Senior Deputy Attorney General in the North Carolina Department of Justice. In the State Senate, Stein successfully led efforts to put more violent criminals behind bars by expanding the state’s DNA database. Stein wrote the School Safety Act and legislation that banned stalking using GPS tracking devices. In his capacity as Senior Vice President for Advocacy and Advancement Associate General Counsel, Chip is responsible for state level advocacy efforts (primarily focused on the NC General Assembly) as well as communications and fundraising for the NCMS and NCMS Foundation. Chip has a long history in organizational advancement and advocacy. Dating back to college, he has fundraised in numerous paid as well as volunteer capacities. He has led successful corporate and personal annual fund programs and gone through training at the Indiana School of Fundraising. Chip has worked in many different facets of health care ranging from a children’s science and health museum and pharmaceutical sales before going to work directly for physicians and PAs as a medical society executive, first at the county level and then here at NCMS. Dale R. Folwell, CPA was sworn in as State Treasurer of North Carolina in January 2017. As the keeper of the public purse, Treasurer Folwell is responsible for a $100 billion state pension fund that provides retirement benefits for more than 900,000 teachers, law enforcement officers, and other public workers. Under Folwell’s leadership, the pension plan was rated among the top five highest-funded in the country and won accolades for proactive management and funding discipline. In 2018 the state’s coveted AAA bond rating was reaffirmed by every major rating agency, making North Carolina one of only 13 states in the country to hold that distinction. Treasurer Folwell also oversees the State Health Plan, which provides medical and pharmaceutical benefits to more than 720,000 current and retired public employees and is the largest purchaser of health care in North Carolina. Since being appointed as Secretary of the N.C. Department of Health and Human Services in January 2017, Mandy Cohen, MD, MPH, and her team have worked tirelessly to improve the health safety and well-being of North Carolinians. DHHS is a cabinet-level agency with approximately 16,000 employees and an annual budget of $20 billion. Among her top priorities are combating the opioid crisis, building a strong, efficient Medicaid program, and improving early childhood education. A graduate of Cornell University, she received her medical degree from Yale School of Medicine, a Master’s in Public Health from the Harvard School of Public Health and trained in Internal Medicine at Massachusetts General Hospital. “Excellent. Speakers were great and relative to all that is happening in NC right now. Advocacy Days registration includes educational sessions, lunch and Medical Mutual reception on Wednesday, March 13th, and organized legislative visits on March 14th. The cost to register is $95 for NCMGMA members, $125 for non-members and $45 for students. The early registration cutoff is February 27th. After 2/27, the cost of registration increases $20 per person for members and non-members, and $10 per person for students. Reserve your room now at the Raleigh Marriott City Center. Limited standard rooms are available at the discounted rate of $189/night for single/double occupancy plus tax. To reserve your hotel room, please call the hotel directly at 1 (888) 236-2427. Guests making such reservations must identify themselves as members of the NCMGMA. All reservations must be accompanied by a first night room deposit or guaranteed with a major credit card. If a guest does not cancel a reservation within 48 hours before 6:00 PM of the guest’s check-in date, then Hotel may charge the credit card one night’s room fee plus any applicable taxes. Registration cancellations must be received in writing. Cancellations received on or before 5:00 PM on March 5th are entitled to a full refund less a $25 processing fee. No refunds will be awarded for cancellations after 3/5 or for no-shows. 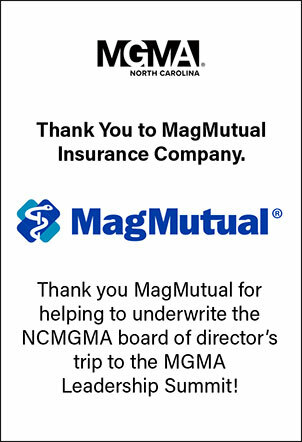 If you have any questions about the NCMGMA Advocacy Days, please contact the NCMGMA offices at 800-753-MGMA (6462) or by email at info@ncmgm.org.